As a modern MIDI connection tool it is unsurpassed in terms of scope and flexibility. Hugely flexible MIDI routing potential. Audio integration. Multi-platform iConnect software. Works better with Mac-based DAWs, rather than Windows. The latest iteration of iConnectivity's journey into multi-device MIDI connectivity is the iConnectMIDI4+. Tagged as a hybrid multi-host MIDI interface with 'Audio passThruTM' technology, this is the bigger brother to its earlier iConnectMIDI2+. In the flesh it is a sturdy metal box, featuring a range of ports both front and back, with the most obvious being the four pairs of MIDI IN/OUT sockets. The unit is, of course, able to connect to your PC or Mac and act as a very capable MIDI interface, but look closer and you'll see two extra USB device ports on the front panel, which are perfectly placed for connecting mobile gear such as an iPad, iPhone or Netbook. In fact, they are both capable of charging connected devices (even the more hefty requirements of an iPad when plugged into Device Port 1). 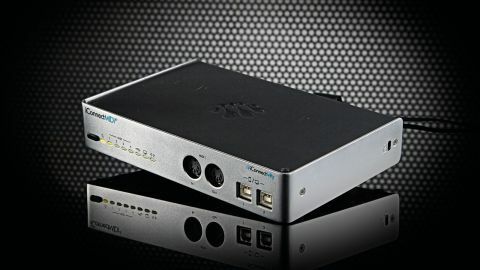 "The icing on the cake for some is that this box doesn't just handle MIDI, but is also inter-device audio"
You will also find a USB host port on the rear, which allows you to connect USB-equipped keyboards and controllers. Armed with an appropriate hub, you can connect up to eight additional devices. It is important to note that these are then managed by the iConnect box (and not directly visible to a connected computer), but this is where things get interesting. The iConnectMIDI4+ is a complicated beast that is somewhat tamed by the (essential) iConfig utility freely available for Mac, Windows and iOS. This allows you to route MIDI between external ports and between devices in almost any way possible, and provides an array of filtering and remapping options. Now throw an Ethernet port into the mix. This can be connected directly to an Ethernet-equipped computer or via a switch or router (even wireless) and adds four additional 'ports' into the mix. Finally, the icing on the cake for some may well be the fact that this box doesn't just handle MIDI, but is also inter-device audio (up to eight simultaneous channels). So, the iConnectMIDI4+ offers a lot in the way of potential - but how does it all work in practice? We took the plunge and connected as many synths, phones, pads and computers to the MIDI4+ as possible to see how it would handle things. As far as MIDI goes, it was flawless - it was our brain that couldn't keep up! Our existing five-port MIDI interface plugged into the rear USB-host port (via a USB 2.0 hub) to extend the conventional MIDI port count to nine. Into the hub also went an Arturia MicroBrute, an iPad 4 (using the included Lightning-equipped cable), iPhone (via an Apple 30-pin adaptor) and Windows DAW filled the remaining USB slots. Finally, we hooked-up our MacBook using a CAT5 Ethernet cable. After configuring a Network MIDI session on Mac (less than a couple of minutes) we could route notes, controllers and MIDI Clock between all of these flawlessly, bringing multiple software and hardware elements together in a way that would have been difficult to achieve previously. We tested the audio connectivity in a range of scenarios and, whilst it is great to be able to route audio from an iPad synth directly into your DAW (for example), and there is a lot of flexibility in terms of how the audio channels are shared between devices (and bit-depth and sample rate settings), it was at its best when used with a Mac (rather than Windows) DAW. OS X is superior in its handling of multiple audio interfaces (and MIDI port naming) - Windows users have to resort to the freeware ASIO4ALL driver to achieve this. Digital clocking, and latency are also potential problems, but this will vary depending on your set-up. All things considered, we loved the iConnectMIDI4+. It's not glamorous or perfect but, for those with complex MIDI needs, it could be a lifesaver. For this alone we believe this unit is worth the price of entry.